"I love the card you made. His is funny! But its so impressive that he gets in there and does his thing. I love it. We have a New Yearversary! LOL It really doesn't have the same ring as Halloversary. But its so fun to do the count down to the New Year, and celebrate another year we survived together! - Megan"
Congrats to MEGAN! You won a pack of Cool Carribean Long Notes as my Halloversary Blog Candy winner. Yippee for you! 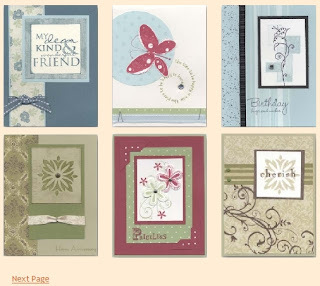 Since one of Stampin' Up! 's big promotions in November is the "Buy 3, Get 1 FREE" special on the Designer Series paper, all the cards featured on my Art Gallery showcase it in some way. I really wanted to be able to share with you some of the cool & fun ways that patterned papers can enhance your cardmaking experience, and I hope that some of them will further inspire you. These will be available on my blog until November 20th, when they'll be switched to feature examples from an upcoming stamp set promotion... wait & see! Click HERE to download 6 great projects, complete with all instructions and details on how to recreate them! p.s. If you're in Canada, don't forget to sign up for my e-newsletter for exclusive specials, offers and contests!